Today will almost certainly be my last day wearing a Microsoft Band 2. After the clasp broke two months into wearing it and the product had to be replaced under warranty; after the subsequent replacement wore through at the bracelet and had to be patched; after the bracelet continued to crack from underneath the patch; after the other side of the bracelet also cracked and wore through; it was finally – finally – time to throw in the towel and get rid of this terrible piece of barely wearable technology. As my regular readers know, I was initially quite impressed by the Band 2. I said when I first got it that it offered many important improvements over its predecessors in the history of wearable running gadgets. Those observations remain true today. Unfortunately, none of that matters if the darn thing breaks and falls apart after a couple of months of normal use. Ultimately, the Band 2 suffers from the same design flaw that proved to be the Nike+ GPS watch’s undoing: by placing core hardware inside the bracelet, the manufacturers ensured that the device would fail as soon as anything bad happened to the bracelet. Note that Nike discontinued its running watch and never produced a replacement, opting instead to concentrate on a smartphone app. I don’t know what Microsoft’s plans are as far as future Band products go, but considering what an utter failure the Band 2 ended up being – based solely on hardware design shortcomings, it must be emphasized – it seems unlikely that Microsoft would be keep to jump back into the smart watch game. But then again, no one else is making a Windows-platform smart watch, and Microsoft apparently aims to compete with the likes of Google and Apple. Unfortunately for Microsoft, however, the failure of their Band 2 – the complete and utter avoidable failure of it all – has soured me not only on future Band products, but also on Microsoft products as a whole. The Band 2 was relatively pricey at $250. While the software that it runs is undeniably good, I feel the sting of loss here. Perhaps if I were made of money, then I wouldn’t think twice about burning through $250 on an experimental smart watch. But this hurts. Before my second Band 2 fell apart, I was seriously considering replacing my laptop with a Surface Pro. They look so cool. They seem so good. It’s tempting. But when I think about my experience with the Band 2, I suddenly become reticent. Why would I spend $900-$1500 on Microsoft’s flagship hardware when their $250 wearable couldn’t last me two measly months? I simply can’t justify it. Microsoft made the mistake of losing me as a customer for life. I’ve gone from being a promoter to a detractor. Well, enough sour grapes. I still love tracking my activity, but now what do I do? My back-up plan was always to revert back to my trusty Garmin Forerunner 620. This highly reliable device sucked me into the wearable tech game in the first place, by providing me with an endless sea of graphs and charts to gaze at every time I ran. I even got into heart rate zone training for a while because of it. Something that worked so well for so long, without any signs of device failure whatsoever, could surely last me a little longer. As I considered dusting off the old 620, I realized that without my daily step count, continuous heart rate monitoring, sleep monitoring, etc., I’d really be missing out on a lot of good fun. Meanwhile, I had good evidence to suggest that there is at least one company out there that knows how to make a fitness watch that doesn’t immediately fall apart: Garmin. So, I thought, why not replace my miserable broken Microsoft thing with Garmin’s equivalent offering? 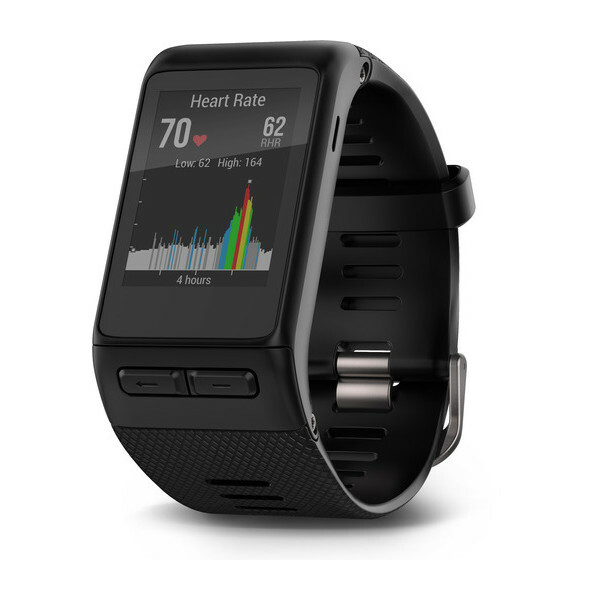 Here I had essentially two choices: I could opt for the modern-day equivalent of my Forerunner 620, which was Garmin’s flagship model at the time I got it, or I could opt for the model more closely resembling my Band 2. Each product has its own advantages, and of particular interest to me and my readers was the Forerunner 735XT’s advanced running features, such as VO2 max estimator, recovery advisor, and race predictor. But at a price of $450, I realized that I’d be spending about $200 more to receive statistics that were simply not worth $200 to me. Instead, I opted for the vivoactive HR device. I may lose out on some of these deeper running stats, but the device will still deliver all of the benefits of my Microsoft Band 2, plus a few Garmin exclusives like the GLONASS location tracking system. And, to my delight, it seems that Garmin has greatly improved on its mobile app since the days of my Forerunner 620, so I should have something that is superior to the Band 2 in every way that matters. And I’m speculating here, but I think I can actually gain access to at least some of the Forerunner line’s running stats if I connect the vivoactive HR to the chest strap HR monitor that came with my 620, i.e. that I already own. More on that if it pans out. For now, it’s time to charge up my new device and prepare to move back over to a superior fitness tracker. The journey continues.